Last month we discussed several Artistic Principles (Elements of Design); tricks of the trade for designing a more pleasing garden. 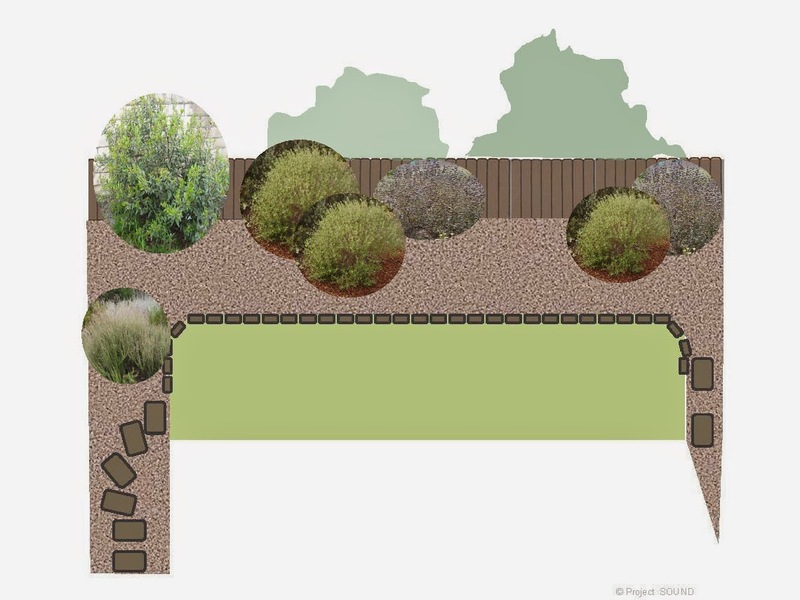 If you didn’t read last month’s post, take the time to read it now: http://mother-natures-backyard.blogspot.com/2014/07/designing-your-new-california-garden-11.html This month we consider additional design principles and create a preliminary planting plan. Several design principles apply to the overall design. These are a bit more difficult to understand, but we’ll do our best to explain them and provide examples. Unity/Harmony – refers to the harmony between all parts of the design to create a pleasing whole. A harmonious design feels complete. The parts all work well together and the design looks planned. One of the easiest ways to achieve harmony is to choose a unifying garden theme. Whatever the theme – ‘purple flowers’, ‘Japanese Garden’ or ‘coastal sage scrub plants’ – a theme creates a unified appearance. The theme limits choices and results in harmony. Unity should be considered when choosing both plants and hardscape. In fact, a unified hardscape scheme is another easy trick for achieving harmony. Select path/patio materials, pavers, mulch and other hardscape materials with similar characteristics: color, texture, etc. Use walls, fences, screens and arbors of the same material, color and design. The garden will exhibit unity, even if your plant materials demonstrate variety. Some gardens include views of nature. Using locally native plants and hardscape connects the garden with the local native landscape, creating a harmonious whole. Consider choosing the local native plant palette as your theme, particularly if your garden has inspiring views of native scenery. Balance – involves the distribution of the visual weights of objects, colors, textures and space. This principle works hand in hand with proportion and scale to provide a design that feels stable. You can think of balance in terms of a scale: the two sides of a design should appear to have equal ‘weight’ in terms of their visual characteristics. Have you seen a garden with a large, dense hedge on one side and nothing on the other? The yard probably seemed unsettled or unfinished. This is because the design was unbalanced; all the ‘weight’ was concentrated on the side with the dense hedge. Another example is a front yard with a large, decorative planter on one side and grass on the other. The yard appears unbalanced because there’s nothing substantial to counter the visual ‘weight’ of the planter. There are several ways to create balance. In symmetrical balance, elements in one half of the design mirror those in the other. For example, a large planter is balanced by its twin on the other side of the front yard. Pathways, fences, screens, planters and other prominent hardscape elements are often used to achieve symmetrical balance. For example, symmetrically balanced pathways are used in formal herb or parterre gardens: the design is geometric, with one half the mirror image of the other. Symmetrical balance can also be used in designing the planting plan. A large shrub or mass of colorful flowers is balanced by a similar mass. Or the shape and content of a flower bed is repeated, or mirrored, on both sides of the garden. Symmetrical balance is easy to achieve; you simply split the area in half (or quarters) and repeat the design elements. Symmetrical balance has a formal appearance. If you like a formal look, use geometric shapes and symmetrical balance in your design. In fact, symmetric balance can create a neat, balanced look, even if the plants themselves (herbs; vegetables; native plants) have an informal appearance. That’s one reason why formal herb gardens are so appealing – they provide a nice juxtaposition of formal and informal. 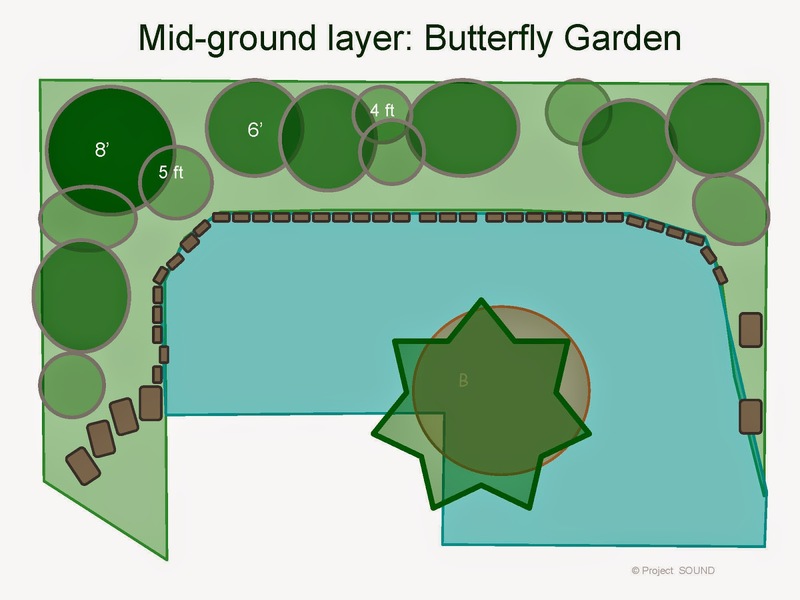 Some very formal, planned gardens feature another type of balance: asymmetrical balance. Gardens with an Asian influence, such as formal Japanese style gardens, provide excellent examples. In asymmetrical balance, the two sides are different but still appear to ‘weigh’ the same. Asymmetrical balance is more difficult for beginning designers to achieve. But you can train your eye to appreciate and use it by observing good examples. Japanese gardens, particularly the large formal gardens found in many large cities, take asymmetrical balance to a high level. We suggest visiting or studying a good book on classic Japanese gardens. Note how plants, rocks and other features are placed to create a balanced design. You will note that design elements are usually in groups of three, five or other uneven numbers. Asymmetrical balance is also used in informal or natural gardens. Paths may meander and plants appear as if planted by Mother Nature herself. But the overall view across the garden should still appear balanced. For example, a single large shrub may be ‘balanced’ by a cluster of smaller, dense shrubs that have the same visual ‘weight’. Or an accent plant, with unusual foliage color, is balanced by a larger evergreen shrub. The key is to have neither side more prominent (‘heavy’) than the other. A third type of balance is radial balance. In radial balance the design elements are arranged around a central point, somewhat like the spokes of a wheel. The design may feature a full circle or, more commonly, a half- or quarter-circle. Radial balance can be used to create striking garden designs. Currently, it’s most frequently used for decorative vegetable and herb gardens. But radial balance is the basis for many an interesting garden. Movement describes the path the viewer’s eye takes through a design or work of art. The best garden designs are balanced, but not static. The eye travels through the garden, creating a sense of movement, change and interest. Use of Vertical Space. Design is all about the use of space; vertical space refers to the space above the ground. Gardeners with small gardens often exploit vertical space creatively. But its effective use is a hallmark of good garden design, even when space isn’t an issue. Beginning designers often underestimate the importance of vertical space. They concentrate on very low-growing plants (grass; groundcovers) and large plants (trees). But the best gardens (and nature itself) include plants of many heights, including medium and large shrubs, perennials and vines/climbers. Utilizing all levels vertical space creates a more interesting garden. It allows you to use space effectively, thus including more plants. The increased variety attracts more birds, butterflies and pollinators. So there are both design and practical reasons to use your vertical space. 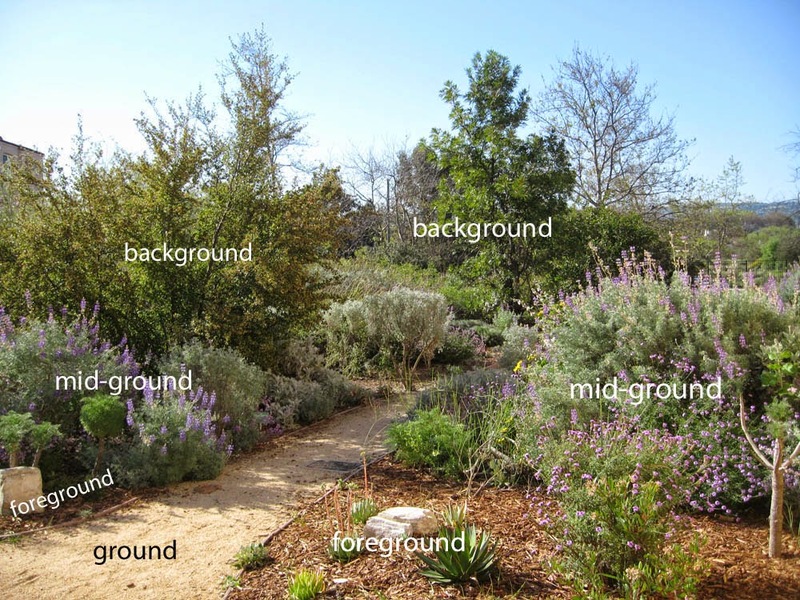 Garden designers often refer to the ‘ground’, ‘foreground’, ‘mid-ground’ and ‘background’ areas of a design. The ground layer is planted with very low plants – grasses, lawns and low groundcovers for the most part. In some gardens, the patios, seating areas, walkways and other low hardscape are important elements of the ground layer (see above). The foreground is the next tallest layer. It’s the area nearest the viewer – in the front of beds, directly adjacent to paths and seating areas, etc. The foreground features plants that are best viewed up close. Foreground plants are the ‘lead actors’ and ‘divas’ in the garden drama. They often are plants with special attributes – interesting flowers, foliage or form (see the succulents in the foreground, above) or delicate scent. Of necessity, foreground plants are also the shortest, usually in the 1-2 foot range. Many gardeners include annuals and bulbs in the foreground. But smaller decorative grasses, succulents, cacti, ferns and perennials are also candidates. The mid-ground provides additional interest to the design. Composed primarily of plants in the 2-5 foot range, the mid-ground takes up most of the space in a typical garden/garden room. In California, the mid-ground is primarily composed of smaller shrubs, half-woody sub-shrubs and larger perennials. These plants are often chosen for their foliage attributes, although they may also have flowers and interesting fruits/seeds. Since mid-ground plants are viewed at a greater distance, they are most important for the overall impression they give; ‘white foliage’, ‘purple flowers’, ‘small leaves’, etc. They often are massed to increase their impact. Many mid-ground plants have seasonal attributes (purple flowers) in addition to their season-spanning foliage, shape and texture. 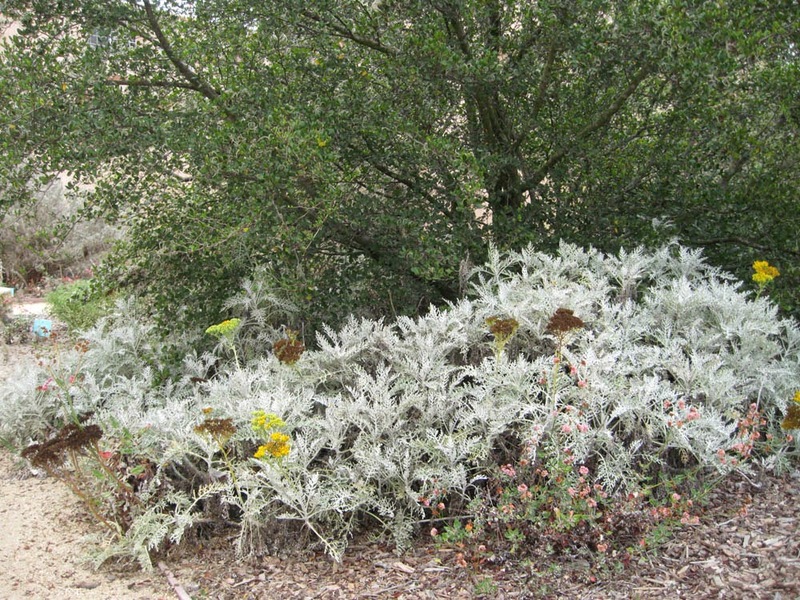 In the photo above, note how mid-ground plants add foliage color (silvery; green) and interesting shapes in addition to the overall impression of ‘purple flowers’. Mid-ground plants provide masses of color and texture that contrast with the unique attributes of the foreground. They are the ‘supporting actors’ in the garden play. Accents, sculpture, bird baths and other garden art are also most appropriate for the mid-ground. They are large and unique enough to compete with the mid-ground plants. And they stand out nicely against the background. The background serves as a backdrop for the fore- and mid-ground. Like a stage backdrop, background plants provide contrast to showcase the plants (actors) in front of them. They are often chosen to provide maximal contrast. Background plants tend to be evergreen, medium to dark in foliage color and of simple, dense texture. Note how the darker, relatively dense background shrubs/trees showcase the fore- and mid-ground plants in the photo above. Composed primarily of trees and large shrubs (more than 5 ft. tall), the background can also include taller hardscape elements like walls, fences or screens. In fact, hardscape often provides important background in smaller gardens typical of suburban California. Some gardens feature vines and shrubs grown on trellises or espaliered on a wall or fence. Pleasant views – ‘borrowed landscape’ such as surrounding trees, hills, etc. - can also form part of the background. It’s important to remember that the background is meant to be a backdrop. In most cases, background plants should not serve as accents; and unless there is good reason to accent them, background fences/walls should be of a medium to dark color. When choosing background plants/hardscape, remember that their primary design function is to showcase the plants in front of them. As seen in the photo, well-designed gardens usually provide natural transitions between the vertical layers, with no large gaps in height between the layers. Some very formal contemporary gardens are the exception to the rule; their geometric designs actually feature sharp contrasts between vertical layers. But in most gardens, plantings should not resemble a series of steps. Height should vary within the layers, creating a more natural appearance. But enough talk. Let’s see how these design principles are used in practice. 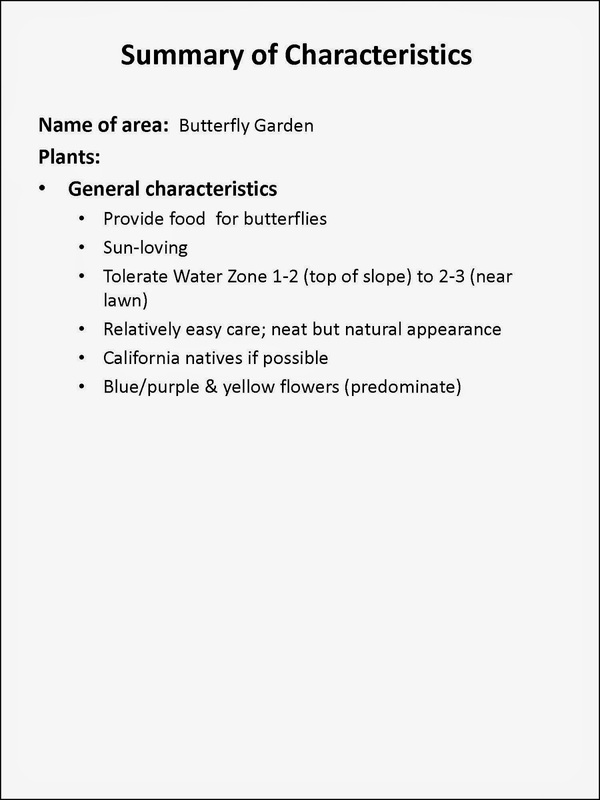 The Butterfly Garden is located at the back of the lot, near the ‘Lawn’ and ‘Vegetable Garden’. As currently envisioned, the area is long and relatively narrow; it’s separated from the Lawn by a simple stone border. It’s a highly visible area, with views from the house, patio and ‘Shady Seating Area’. Our gardeners begin with a Summary of Characteristics. At this point, it’s helpful to step back and critically review the basic layout for the entire area. 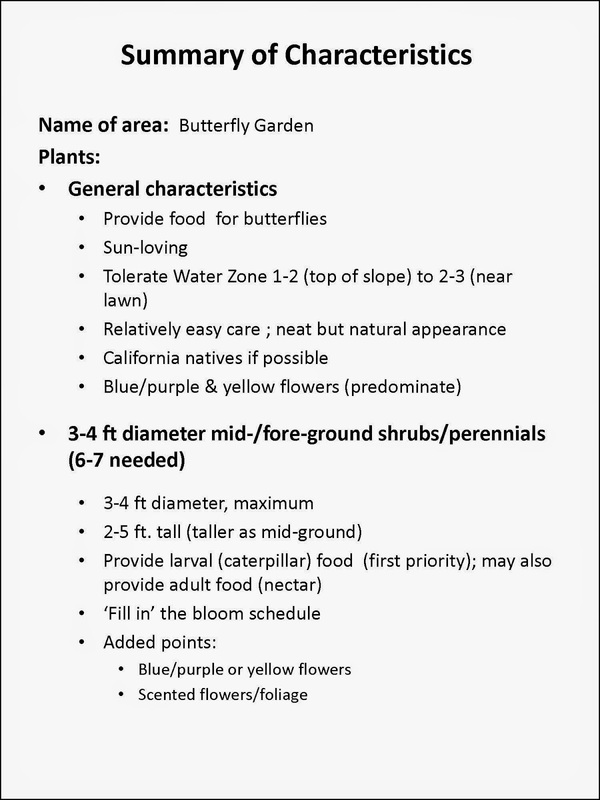 The gardeners enlarge their site map and note the dimensions of the Butterfly Garden. A six foot depth is fairly narrow for a garden/garden bed. When the gardeners pencil in some representative plant sizes, they observe that it may be difficult to use their vertical space in a pleasing way. Unless they want to limit their plant palette to smaller plants (or a hedge & espalier), they need to make the garden deeper. 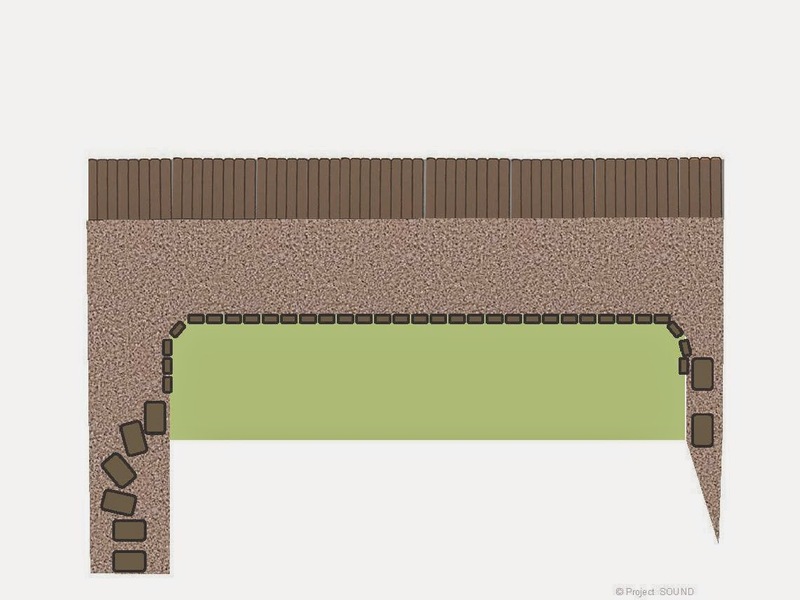 Increasing the depth to 8 feet will decrease the ‘Lawn’ slightly, but expand their options dramatically. The gardeners draw in the stone border and pavers. The new layout has space for some larger shrubs, in addition to smaller plants. In fact, their design can now include limited fore-, mid- and background areas. This will be far more interesting and provide additional area for butterfly habitat. Let’s review how the principles of design are currently reflected in the backyard at 112 Willow St. 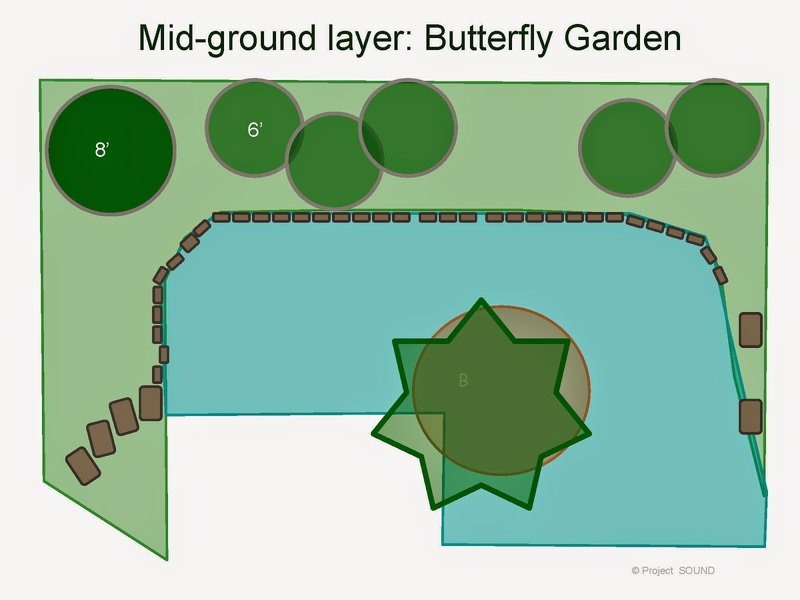 The three main planted areas (‘Lawn’, ‘Butterfly Garden’ and ‘Vegetable Garden’) are treated as three garden rooms, separated by stone/planted borders. The viewer can see the entire backyard, but still gets a sense of enclosure for each area. The entire backyard is surrounded by a 5 ft. tall fence, increasing the sense of enclosure. The backyard is unified by the theme: ‘food for all’. The hardscape colors and textures have been chosen carefully. They provide a uniform, natural appearance and their grayed colors will blend into the landscape. The same mulch will be used in the Butterfly and Vegetable gardens. The hardscape unifies the entire backyard, producing an additional sense of harmony across the three ‘rooms’. The stone border provides a semi-formal separation between Lawn and Butterfly Garden. Our gardeners lay out their proposed border with a rope and spend some time observing its lines. 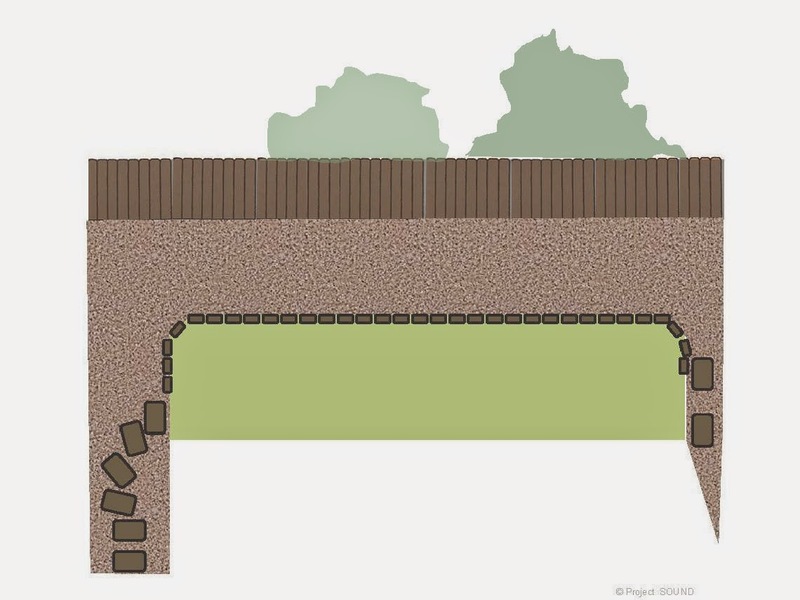 They decide to extend the border to include a narrow area between the Lawn and Vegetable Garden. The line of the stone border now forms a rough semi-circle, providing symmetrical balance. The sweeping arc leads the eye on a panoramic view of the entire backyard (creates a sense of movement). The shape of the arc is reinforced by the line of the perimeter fence. The garden at 112 Willow demonstrates how hardscape provides the backbone of the garden design. It sets a tone that is semi-formal, helps to define several outdoor rooms, provides a feeling of unity and leads the eye by creating a pleasing line for the eye to follow. Even with no plants in place, the hardscape creates an interesting landscape. The gardeners next consider the plants for the Butterfly Garden. Note that they are defining the characteristics of the plants; their cultural, size and other characteristics. They are not choosing specific plants at this stage. The general plant characteristics reflect cultural conditions particular to the site (light; soil; drainage; etc.) as well as the functional and aesthetic standards that all plants must meet. 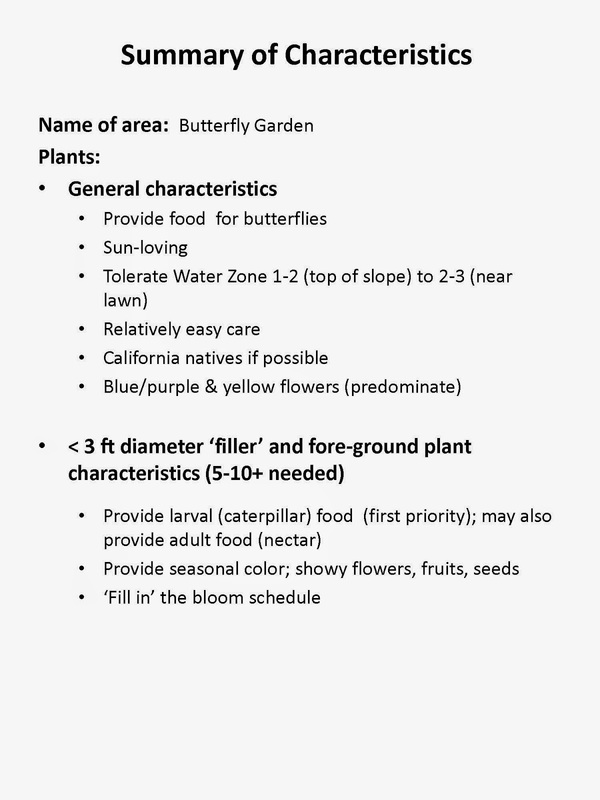 Since this is a butterfly garden, all plants must provide something (mostly food) for either adult or juvenile (larval) butterflies. 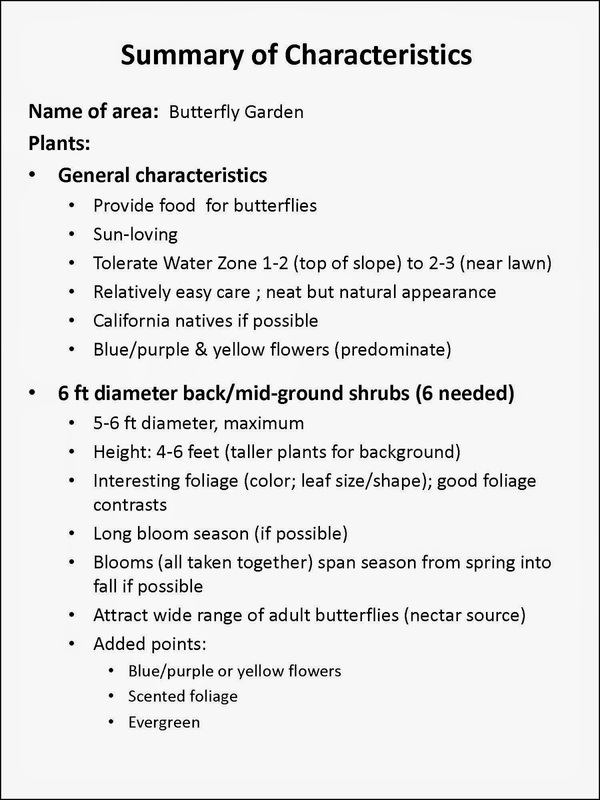 The gardeners have learned that native plants are particularly good butterfly plants, so the garden will emphasize California natives. Native plants often have a somewhat informal natural shape. While some native shrubs can be pruned to quite formal shapes, many gardeners prefer a more natural look – tidy but not too manicured. This also makes gardening easier, limiting pruning to several times a year. The informal appearance of native plants lends well to asymmetric balance. In the garden at 112 Willow Street, the hardscape utilizes more formal, symmetrical balance, while the plants will be balanced asymmetrically. The easiest place to begin is the background layer. It features the largest plants - those most difficult to place in a small garden. Because their primary role is to provide a backdrop, they tend to have more simple characteristics; but their size, both vertical and horizontal, is of critical importance. As noted below, a background plant will be given additional points if it has flowers/fruits (added value). The gardeners now must place the background plant(s) in space. In creating a rough layout, they must consider both the horizontal (map or plan view) as well as the vertical placement (elevation view). 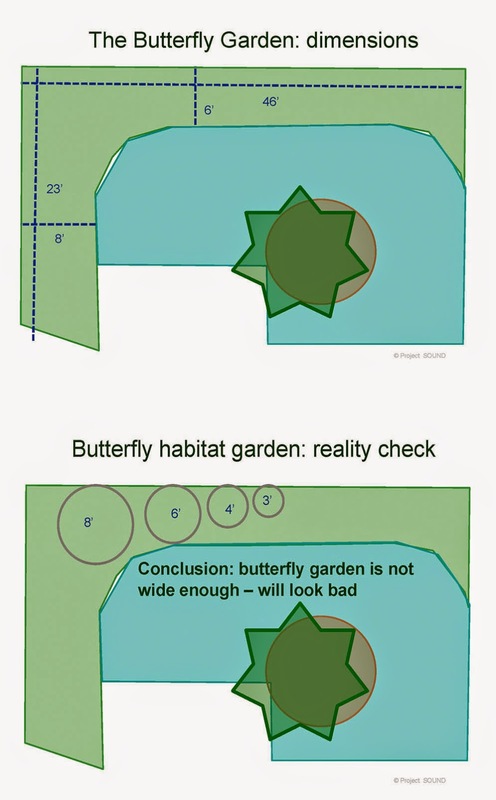 To maximize their limited space, the gardeners decide to locate a single large shrub in the roomiest part of the Butterfly Garden. They place an appropriately sized circle on their map (below). Now the gardeners consider the elevation view. First, they create a background elevation plan/drawing. They can either draw it on paper (to scale) or create it on the computer. They can then use shapes or cut-outs of plants (paper or digital) that can be moved around, allowing them to see how the design will look. Our gardeners have access to PowerPoint and a scanner, so they create their elevation view digitally. They scan in a picture of a fence (similar to the actual fence) and create a scaled elevation plan, adding in the lawn (ground layer). Here’s how their elevation looks with the hardscape in place. The perspective isn’t perfect, but it’s fine for their purposes. A quick look from the porch reminds the gardeners that their background layer is more complex than currently depicted. They add the ‘borrowed’ distant trees to their elevation plan. This now reflects what the viewer will see when they admire the garden. The background layer will include the perimeter fence, ‘borrowed’ views and some medium to large (5-7 ft. tall) shrubs. This is fairly typical for a small garden. The gardeners add the large background shrub to see how well it fits. The large shrub counter-balances the distant trees, forming a balanced background. In fact, the Vegetable Garden (not shown) also adds weight to the right side of the design. The gardeners will need to consider this when they place additional plants and accents (such as the birdbath). In total, elements on the left side must have sufficient visual weight to balance the Vegetable Garden. The Butterfly Garden has limited space for mid-ground plants. 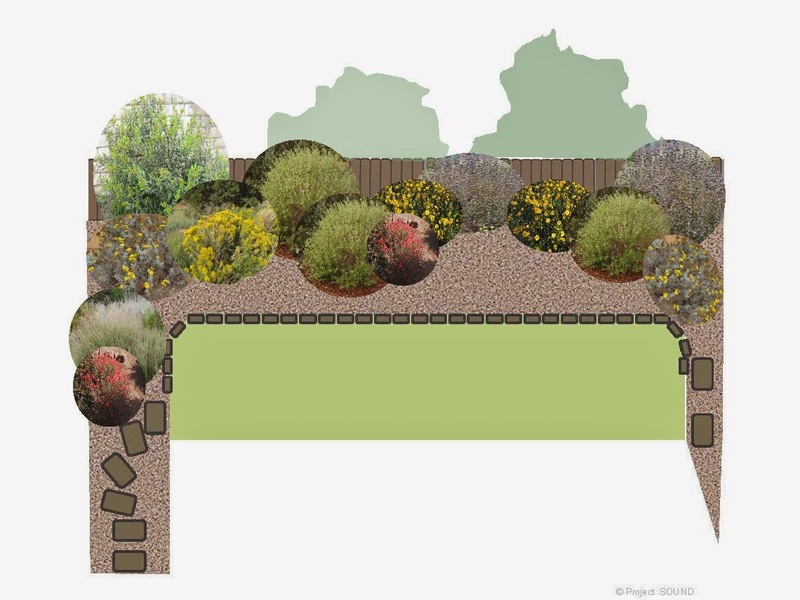 The California native shrubs which will comprise most of the mid-ground are of two types: shrubs in the 5-6 ft. diameter range, and smaller sub-shrubs/perennials in the 3-4 ft. range. The gardeners decide to tackle the larger shrubs first, as these will be more difficult to place. The garden can accommodate only 6 or 7 plants with 5-6 ft diameters. Because the mid-ground provides most of the over-all ‘feel’ of the garden, our gardeners have considered the characteristics of these plants carefully. They will provide masses of foliage/floral color. They will likely provide much of the nectar adult butterflies will use as food, so bloom season is an important consideration. The foliage will provide contrast with the background and with other mid-ground plants. Fortunately, California native shrubs offer an abundance of foliage characteristics. Because there is limited space, the plants will need to be chosen carefully - but that’s next month’s task. Now the gardeners simply need to locate them on the map. Note how the gardeners grouped the plants, rather than simply spreading them throughout the garden. Another option, briefly considered, was to form a shrub hedge along the perimeter fence. This was rejected because the gardeners felt it would look ‘boring’. The informal groupings add just the right amount of complexity to the design. The garden will include a decorative birdbath. The gardeners need to decide on the actual piece before they locate it in the mid-ground. They will place the birdbath where it provides easy access for birds and viewing. But they will also highlight its decorative features by proper placement. 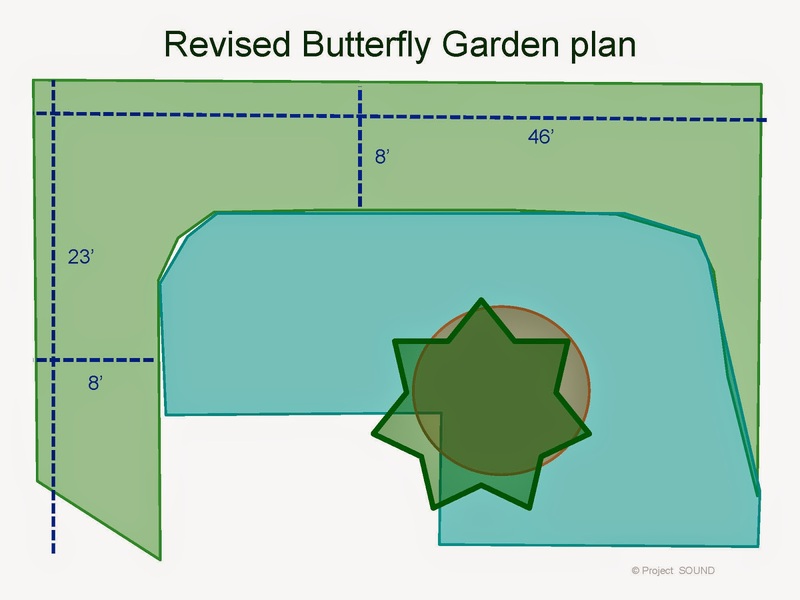 The gardeners add the larger shrubs to their elevation plan, using cutouts of representative plants. 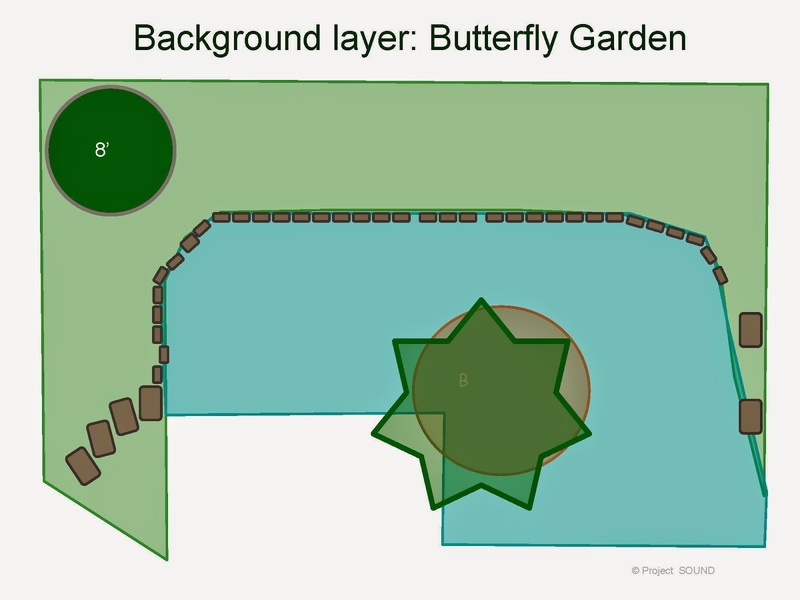 At this point, the gardeners are creating a rough layout; they may need to fine-tune placement once actual plant species are chosen. For their representative plants, they choose examples with different foliage characteristics and sizes to more closely represent how the garden will appear. The gardeners have repeated two of the larger mid-ground shrubs; one with medium green foliage and another that’s grayer. Notice how the repetition adds ‘motion’ to landscape as your eye naturally moves from like to like. There is just enough variability to keep the garden from being static (boring). Given a limited number of plants, beginning designers may be tempted to plant ‘one of each’ to increase the number of plant species. When choosing mid-ground plants, remember that repetition (mass planting) produces a better design. If you want to increase the number of species, choose several with a similar overall appearance to give the illusion of repetition. The smaller sub-shrubs and perennials, with diameters of 3-4 feet and heights from 2-5 feet, are appropriate as fillers in the mid-ground. Some of the shorter plants might also work as foreground species. The smaller sub-shrubs and perennials will be an important source of caterpillar food. In fact, this will be a key attribute of the plants chosen. Others will be selected because they bloom during off-season periods – early spring and fall. Smaller plants are relatively easy to locate once the larger plants are in place (above). Notice how quickly the space is filling up. The gardeners will need to choose plants with the appropriate final (mature) diameters, or they will end up with too many plants in their small space. Some trees and shrubs look small at planting but quickly grow to impressive size. 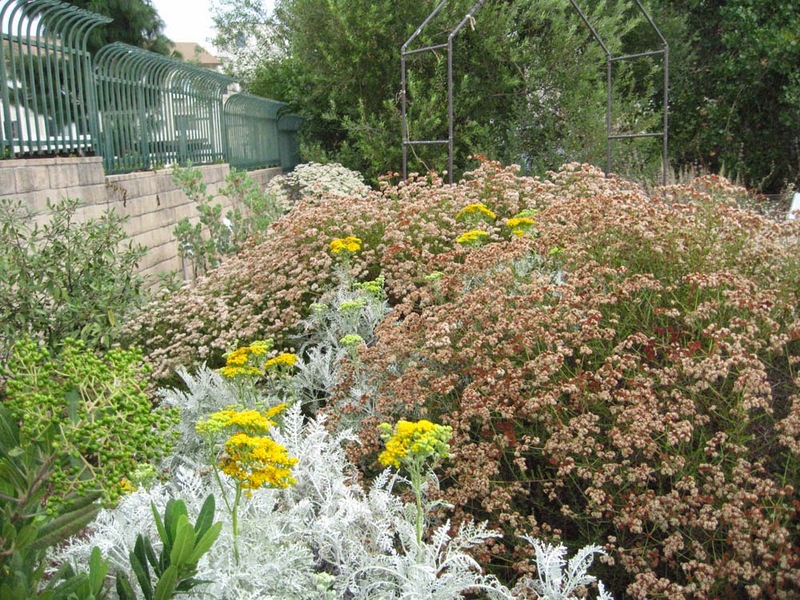 Over-planting is a common mistake (particularly with California native plants). That’s a costly error the gardeners at 112 Willow St. want to avoid. The current elevation looks pretty good. There is variability in height and other characteristics. The gardeners repeat several plants, using the principle of repetition. All that’s left is to add the foreground. Our gardeners have taken the design principles to heart. The foreground plants provide the interest – color, seed-pods, seeds, scents – that is lacking in the other layers. The foreground will likely include some plants chose specifically as caterpillar food. The foreground plants will complete the garden. They will also serve as fillers between the larger plants, particularly in the early days, when larger plants have yet to reach their mature size. 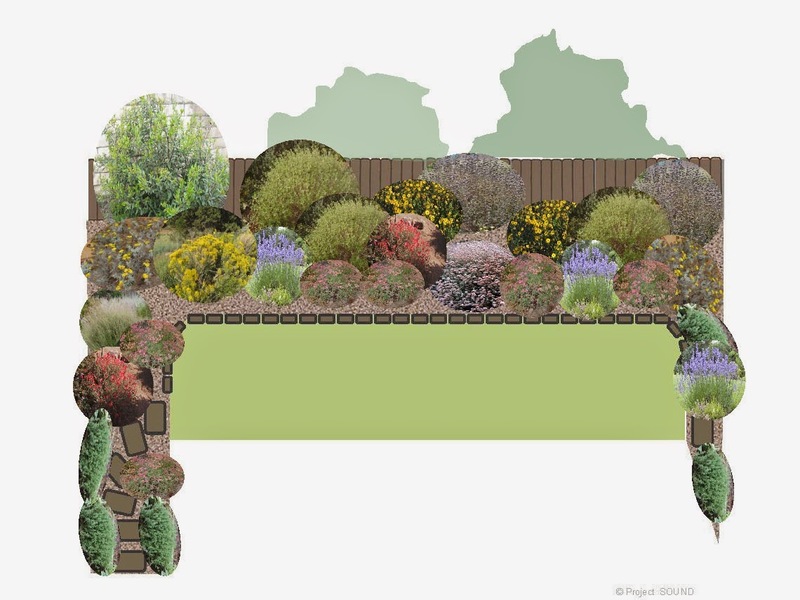 The final elevation drawing gives the gardeners an idea of how their mature garden will appear. The gardeners at 122 Willow St. have accomplished a great deal this month. 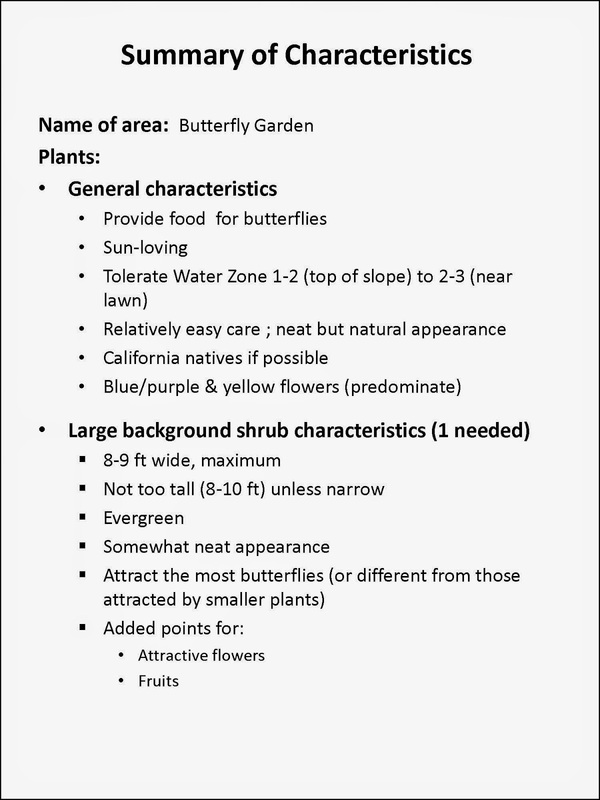 Note the care with which they’ve defined plant characteristics for each tier of the garden. This work will pay off next month when they select their plant species (Sept/2014). Instead of feeling overwhelmed, they will confidently search for plants that meet specific criteria. And we’ll introduce some great resources to help them in their search. The gardeners have also produced a draft layout plan. This will be modified as the actual plants are selected. But the basic plan – the backbone of the final planting plan – is done. The design looks good in both the map and elevation views. 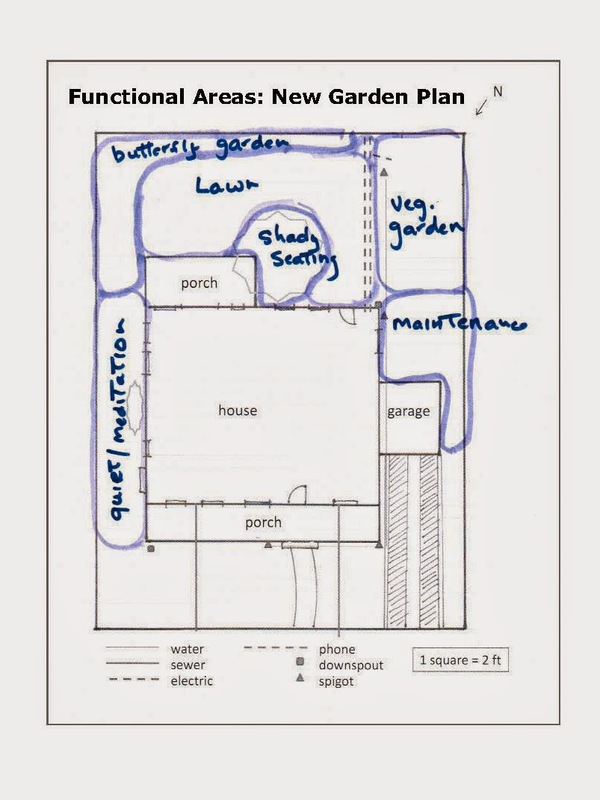 Good luck in developing the Summaries of Characteristics and draft layout plans for your own garden. 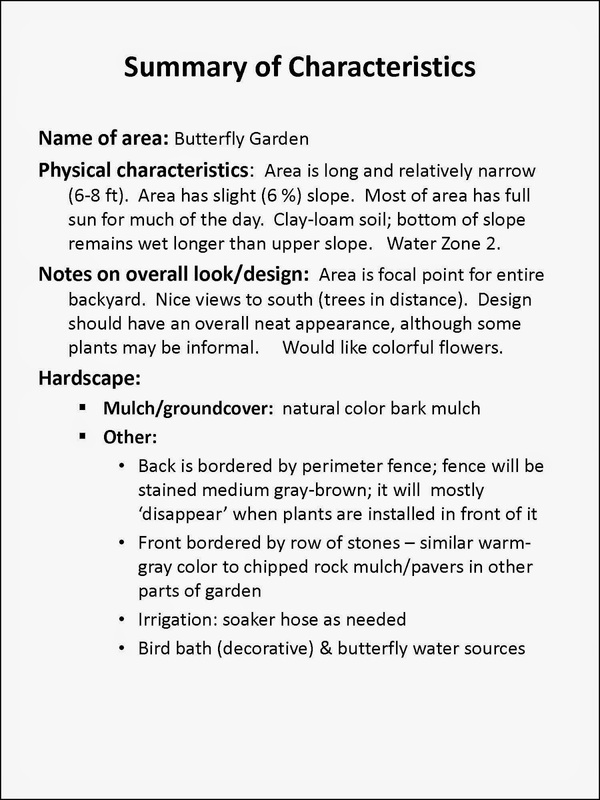 Review your Garden Notebook to refresh your memory about relevant site characteristics, family needs/desires and hardscape choices. Take the time to think, dream, and try out different arrangements. Sit in the garden, with the plans in hand, and visualize your New California Garden. See you back next month. Last month we featured one of our loveliest silvery foliage plants – Perityle incana. This month the whitest of them all, Catalina silverlace (Nevin's Wooly Sunflower), is blooming for the first time. It simply begged us to be featured as our Plant of the Month. As with other Wooly sunflowers, Constancea nevinii has an extremely limited natural range, being found only on the Southern Channel Islands (San Clemente and Santa Catalina Islands) and the Northern Santa Barbara Island. The Channel Islands, located just off the coast of central and southern California, are places of great biologic interest. Like most islands, they contain unique species due to their separation from mainland populations. But the Channel Islands have several other unique features. Located at the edge of a tectonic plate, the Channel Islands have experienced extensive movement over millions of years, resulting in unique geologic and soil profiles. As sea levels rose and fell, they were joined and separated from the mainland several times, allowing for species exchange. Their close proximity has facilitated human visitation/habitation for at least thousands of years, resulting in further exchange of seeds/plants between islands and the mainland. The combination of these factors makes the California Channel Islands unique in their flora, fauna and geology; they are currently the subject of great scientific interest. Unfortunately, many of the endemic species are now extremely rare, often due to human actions like hunting, farming and grazing. Feral goats have played a particularly destructive role on several islands; their removal has been an important step in preserving native plants. Interestingly, several island plant species (including Constancea nevinii) are well suited to gardens and are now used extensively in Southern California mainland gardens. Catalina silverlace, a sub-shrub with woody stem, stands 2-5 ft. tall and at least as wide. 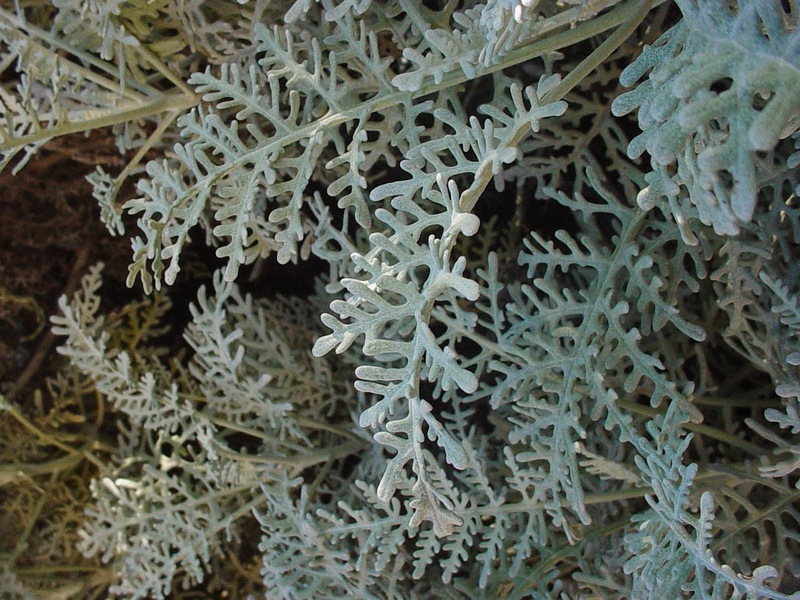 It closely resembles the ‘Dusty Miller’ (Jacobaea maritima/Senecio cineraria), a plant long favored for its white foliage and drought tolerance. While Jacobaea maritima hails from the western/central Mediterranean region, it shares more than a superficial resemblance with Catalina silverlace. Both grow in coastal areas, often on rocky coastal bluffs, in areas with a mediterranean climate. Not surprisingly, both are known for their heat, salt and drought tolerance. The two plants represent similar solutions to a shared set of environmental conditions. Catalina silverlace has a mounded, slowly spreading growth habit. Its long leaves are finely dissected (see above) giving them a delicate fern-like appearance. The foliage is covered with dense, wooly white hairs, making the foliage appear almost white. 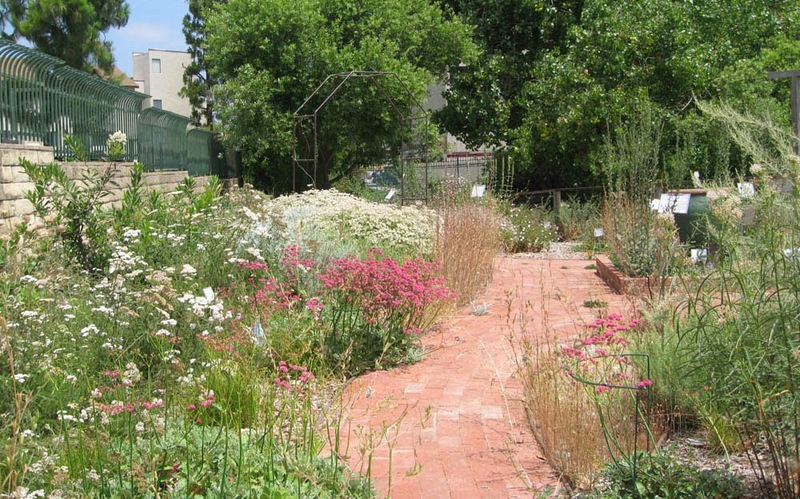 These features help plants survive hot dry summers and are shared with species from other dry climates. The low, mounded growth habit is often found among plants growing right on the coast. This form is particularly suited to the wind and salt spray that dominate coastal landscapes. 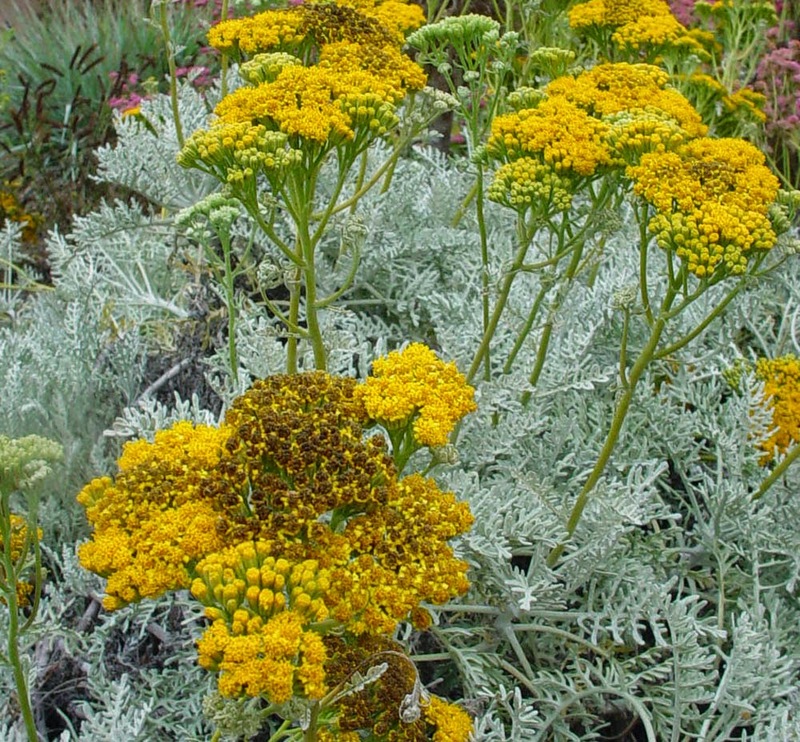 California has native ‘sunflowers’ that bloom from early spring to late fall; Constancea nevinii is a mid-season bloomer. It may flower anytime from April to August depending on weather conditions. In our experience, adequate winter moisture is required for a good bloom season. The flowers are bright yellow, adding a cheerful note to the summer garden. On closer inspection, the flowers reveal their sunflower nature. Flowers have central disk flowers surrounded by a few, very short yellow ray flowers (look like petals). The individual flowers are small, but the heads are arranged in clusters of 20 to 50 on stalks above the foliage. The entire effect is showy as seen in the photo above. Catalina silverlace is a good habitat plant. Pollinator insects are attracted by the flower’s sweet nectar and pollen. Expect to see European Honey Bees, native bees, flower flies, butterflies and others visiting the flowers. Seed-eating birds enjoy the seeds and small animals like lizards will shelter beneath the foliage. Like the native bluckwheats, Catalina silverlace retains its beauty long after the flowering season has ended. The flowering stalks, bracts and seeds turn a lovely dark brown that contrasts exquisitely with the white foliage. In fact, many gardeners consider fall to be the prettiest season for this shrub. The seeds are dry achenes that spread by wind. Catalina silverlace (Constancea (Eriophyllum) nevinii) in fall. 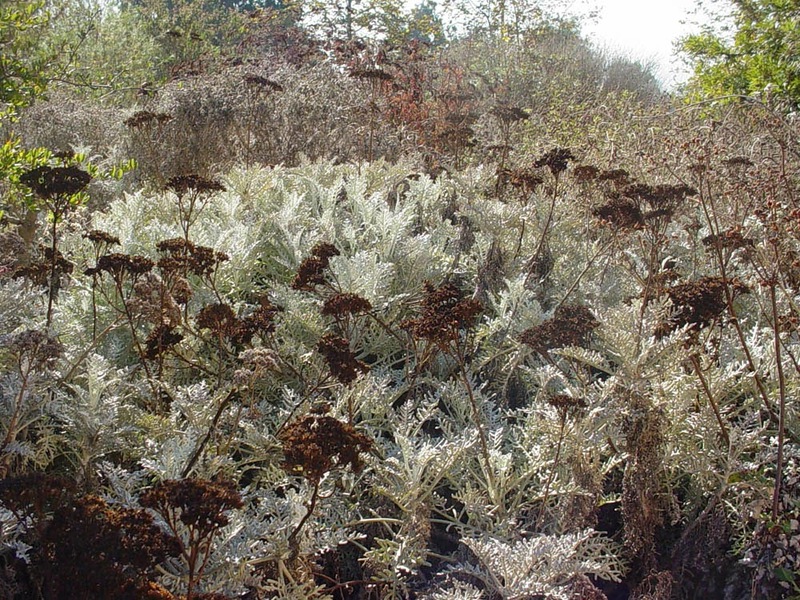 The ‘Island Silver’ cultivar is often available in local native plant nurseries. 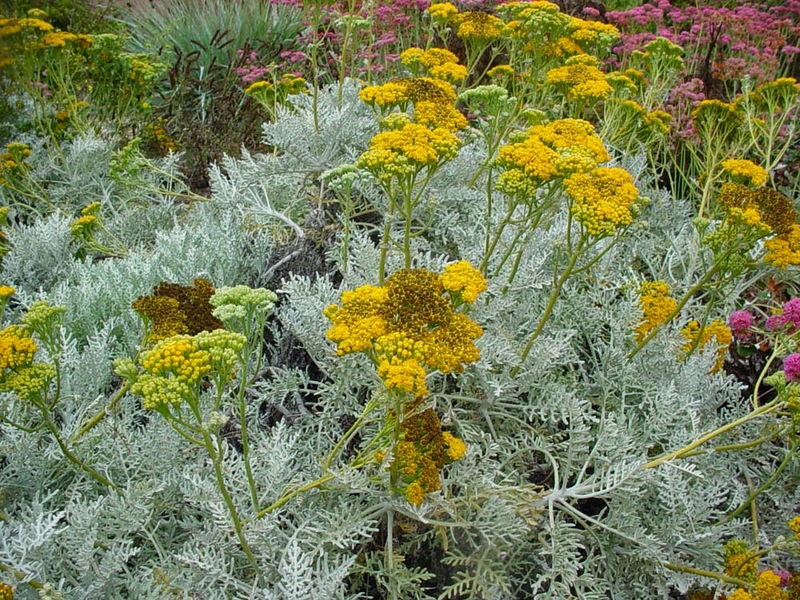 A natural variant from Santa Barbara Island, ‘Island Silver’ was introduced by the Santa Barbara Botanic Garden and has grown there since the early 1980’s. It has very white foliage and all the other characteristics that make this species so attractive. It does well in local gardens and is a good alternative to the straight species. Although preferring a well-drained soil, Constancea nevinii can be grown in clays. If your soil is dense and compacted, try growing it on a slope or berm. Once established, it needs very little supplemental water except in dry winters/springs. In Mother Nature’s Backyard we water it once or twice from May to August. Plants will become leggy if not pruned back regularly in late fall or winter. For fall pruning, remove spend flowering stalks and prune back the leafy stems, leaving 2-3 sets of new leaves. This will result in a nice, mounded habit. Mountain Mahogany. 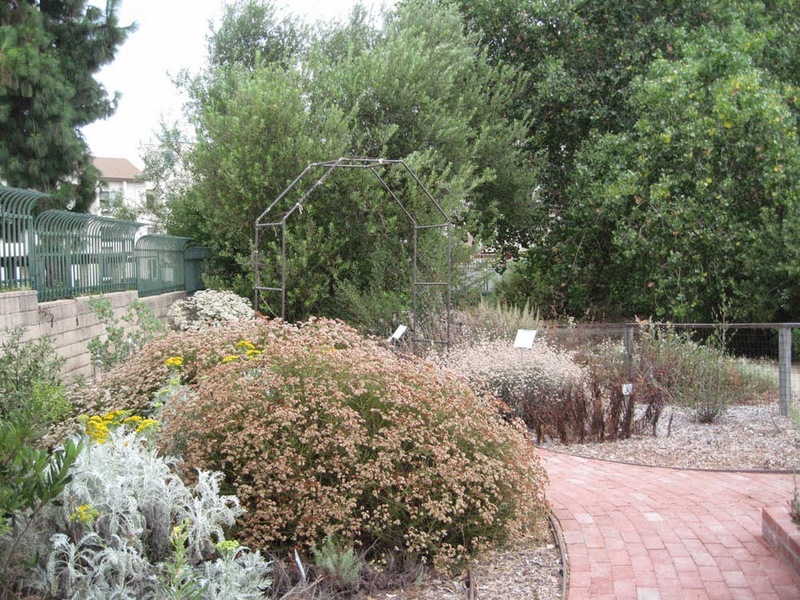 Native Plant Garden, Madrona Marsh Nature Center, Torrance CA. Gardeners from wetter climates often envy our native foliage plants – particularly those with very light-colored leaves. Use Catalina silverlace to best advantage by growing it against an evergreen background of Toyon, Coffeeberry, Lemonadeberry, Sugarbush or Ceanothus (see above). We also like to highlight spring annuals by growing them against a background of Constancea nevinii. The size and shape of Catalina silverlace make it a natural choice as an informal hedge or path border; it also functions well as a low foundation plant or in planters. It is relatively deer-tolerant and is good in fire-prone areas. Consider planting it with California fuschia (Epilobium canum), Cleveland sage (Salvia clevelandii), native buckwheats (Eriogonum species) and native grasses. It provides a touch white in a silver garden and is an elegant addition to a habitat garden. And it is a constant reminder of the special – and rare - plants native to our coastal islands.